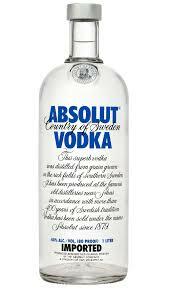 Absolut Vodka is sold in a simple clear bottle whose design has remained constant since first sold in Israel in 1979. 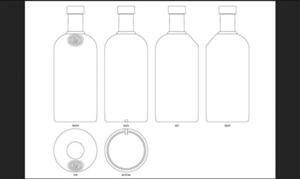 Not unreasonably, the Absolut Company Aktiebolag attempted to register the shape of the bottle as a 3 dimensional trademark (Israel trademark number 238633). The Examiner rejected the mark as lacking distinctive elements, but on appeal, the Commissioner (registrar) of Patents and Trademarks, Assa Kling, allowed the mark to be registered for opposition purposes. His logic was that following the Toffiffee decision of the Israel Supreme Court, the shape of a product may be registered. This has been applied to packaging as well. Although acknowledging that it is important not to allow an unlimited monopoly on the shape of a product packaging, in this decision it was hold that the trademark for the Absolut vodka bottle does not provide a monopoly for all bottles, but only for those with similar dimensions. Adv. Kling went on to note with satisfaction that there is no element which is specifically aesthetic or functional that is being awarded a monopoly for. My dissatisfaction with this decision is that in an earlier decision (by Deputy Commissioner Jacqueline Bracha) that this one refers to, the square brown Cointreau bottle was refused from registration. I believe that the combination of the two decisions creates an absurd state of affairs, and would love to oppose this decision, if a bottle manufacturer or vodka manufacturer would foot the bill. The Cointreau bottle is a classic of poor design, since square bottles have to have thicker glass (and are thus heavier) than standard round bottle equivalents in order to overcome residual stresses from the manufacturing process. This is why the vast majority of bottles are cylindrical with a rounded or tapering top surmounted with a neck for pouring. In contrast to the distinctive and fairly unique Cointreau bottle, the Absolut vodka bottle is a very generic and simple regular clear bottle, which was the logic behind it having been chosen. It is essentially advertising its vodka as pure and simple. the proportions are close to the ideal for minimal likelihood of being knocked over, whilst having a minimal footprint, and being easy to pour. Indeed, whereas Cointreau trades on it’s distinctive taste, Absolut more or less trades on its vodka not having an intrinsic taste since it is almost pure alcohol and distilled water. This enables them to market a range of flavored vodkas. The main difference between an Absolut vodka bottle and, say a wine bottle, is that wine is sealed with a cork since it is supposed to be drunk in one sitting, whereas Absolut (and other vodkas) are sold with screw top lids. Wine is often sold in coloured glass bottles to protect the contents from sunlight. Absolut’s clear glass bottle is fairly reminiscent of laboratory glassware. I don’t think that anyone can reasonably argue that the Absolut vodka bottle is more distinctive and more used as trademark than the Cointreau bottle. In both cases the applicants have tried to protect separately, the various elements of the package. Thus Cointreau tried to register the bottle sans the word Cointreau embossed on the side and without the red ribbon. Absolut was successful in registering the bottle shape in this case, without the restriction of a clear label with distinctive font. Here is a test: take one empty bottle of Cointreau and one empty bottle of Absolut and remove labels. Add plain printed labels for petel (the raspberry flavored cordial that is popular in Israel) and fill with same. Set up a table in a busy pedestrian thoroughfare and offer samples to passersby. I guarantee that the numbers who recognize the Cointreau bottle will vastly outnumber those that recognize the Absolut bottle. Notwithstanding advertising campaigns and the like. In earlier decisions, the bottle of Royal Crown whiskey and Martell and Co.’s brandy bottles have been found registerable. See here. The idea that elements were not to be considered aesthetic or functional was not discussed. Also of note, in a decision by previous Deputy Commissioner Noa Shalev-Shmulevezh, an attempt by Imperial Vodka to register a trademark for a transparent label was rejected as being confusingly similar to Absolut’s. ‹ hotels.co.il – can it be trademarked?